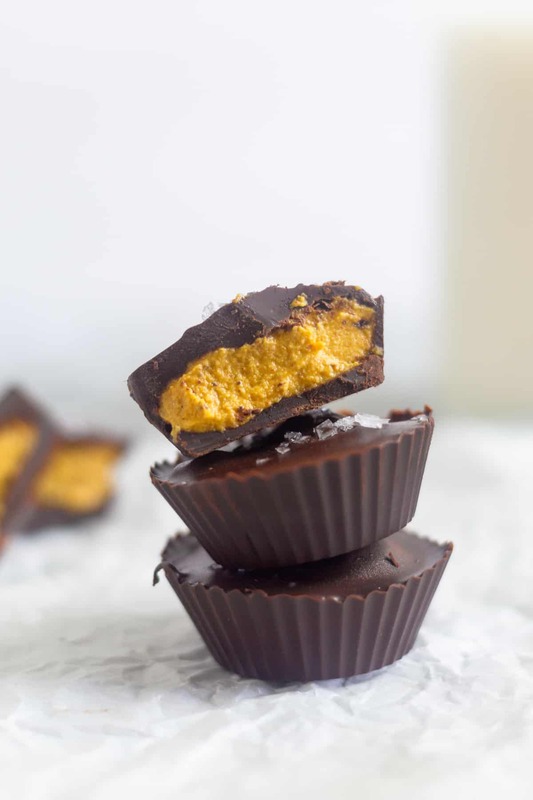 Pumpkin Pie Chocolate Cups are made with only 2 ingredients and make a healthy sweet treat for Halloween, Thanksgiving, or just a casual weeknight! 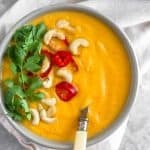 Paleo, vegan, & gluten free. Who is ready for Halloween?! I’m going to raise my hand and say not me! Ha! First and foremost, I really want to get Cashew a costume for when people come by. I mean how cute would that be?! This will be our first Halloween in our new house and I’m so excited for some trick-or-treaters to come by, but that means I need to buy some candy! 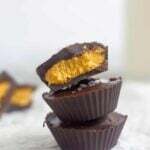 As much as I would love to just give all the kids that come by some of these pumpkin pie chocolate cups, I’m pretty sure that is highly frowned upon. So I am going to go with some classics – milky way, kit kat, twix, butterfingers – and some allergy friendly candy as well..all that good stuff. I’ve mentioned this before, but I was never been a huge chocolate fan growing up. I like the occasional things (milky way and anything chocolate and caramel), but only had them when the holidays came around like Halloween, Easter, and Christmas. My taste buds have definitely changed over the years and now I enjoy it more than I was younger. I try to opt for high quality chocolate or homemade treats instead of the sugar loaded store bought stuff though. 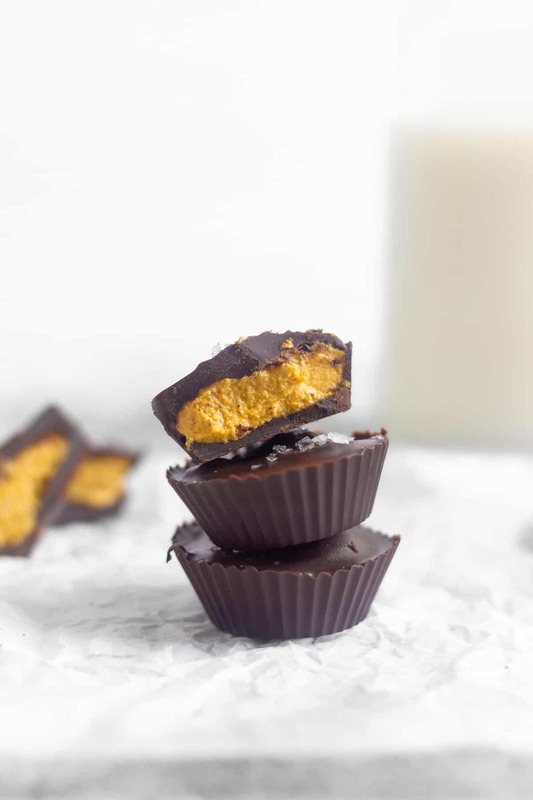 And since it’s the season of candy, I decided I would do a fun pumpkin spin on homemade chocolate cups! These cups pretty much scream fall. I mean pumpkin pie + chocolate = Thanksgiving and Halloween in one! Since my pumpkin pie butter is such a hit with you guys, I wanted to use it in another fun way. I mean eating it with a spoon and spreading it on toast is the bomb, but why not combine it with some chocolate for a healthy dessert! 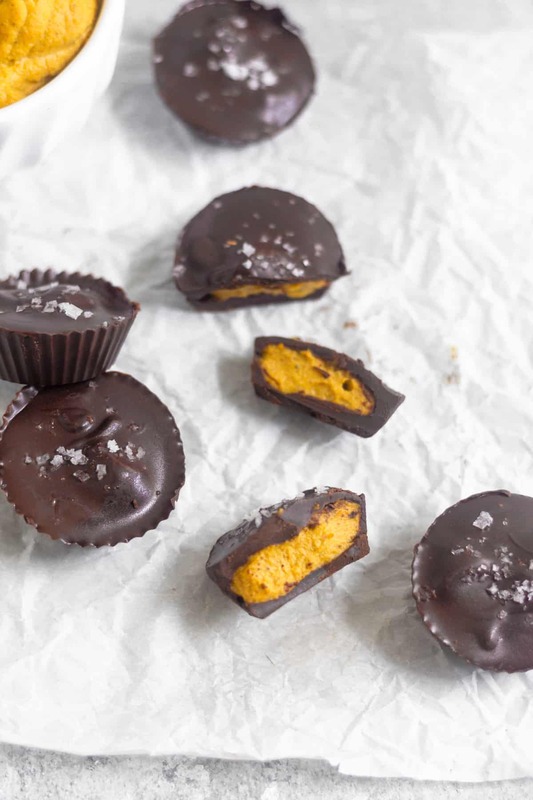 If you already have the pumpkin pie butter made, these come together in about 15 minutes. 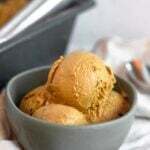 If you need to make the pumpkin pie butter, you can use canned pumpkin if you don’t have a fresh pumpkin on hand. It makes it a lot easier and quicker. 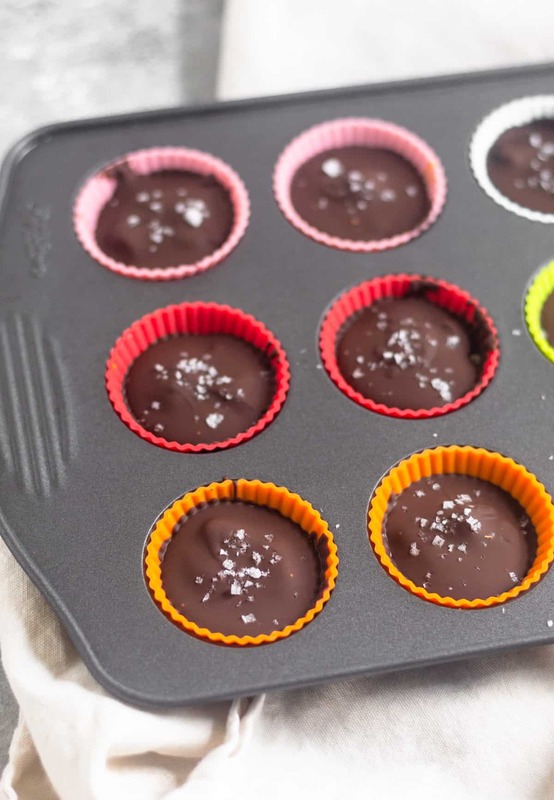 Making homemade chocolate cups takes a few steps, but it really is pretty easy. First you melt the chocolate – I used the double boiler method, but you can also do it in the microwave. Next add a teaspoon or so to your mini silicone muffin molds, making sure you push it against the sides to form a cup. Pop it in the freezer to set for 5 minutes. Then add a teaspoon or so of you pumpkin pie butter and top with the remaining chocolate. Place them back in the freezer to set again and that’s it! 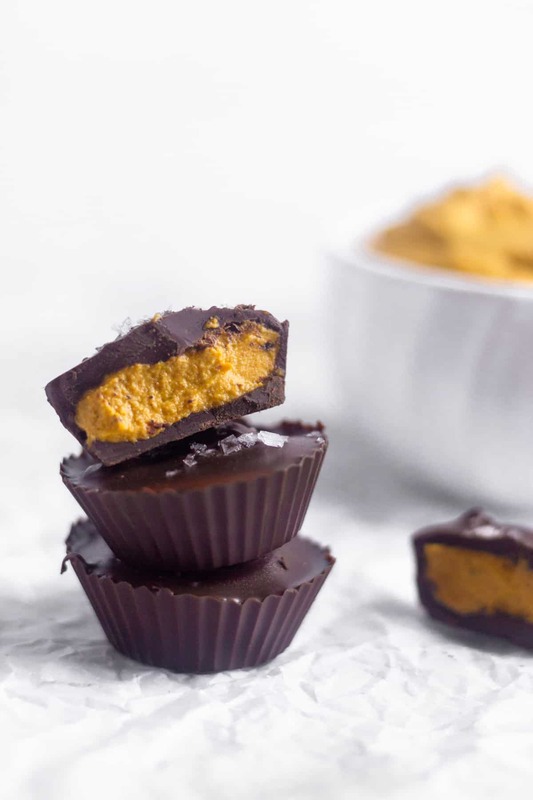 These pumpkin pie chocolate cups make a great healthy sweet treat, a fun party treat, or even a dessert you can make with the family. 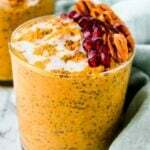 They are packed with some healthy fats from the walnuts as well as some fiber, potassium, and vitamin C from the pumpkin. To store them, we keep them in the freezer and then take them out a few minutes before we want to eat them. They can be stored in the fridge, but I find the hold up better in the freezer. 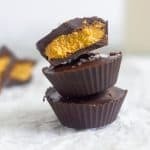 Pumpkin Pie Chocolate Cups are made with only 2 ingredients and make a healthy dessert for Halloween, Thanksgiving, or just a casual weeknight! 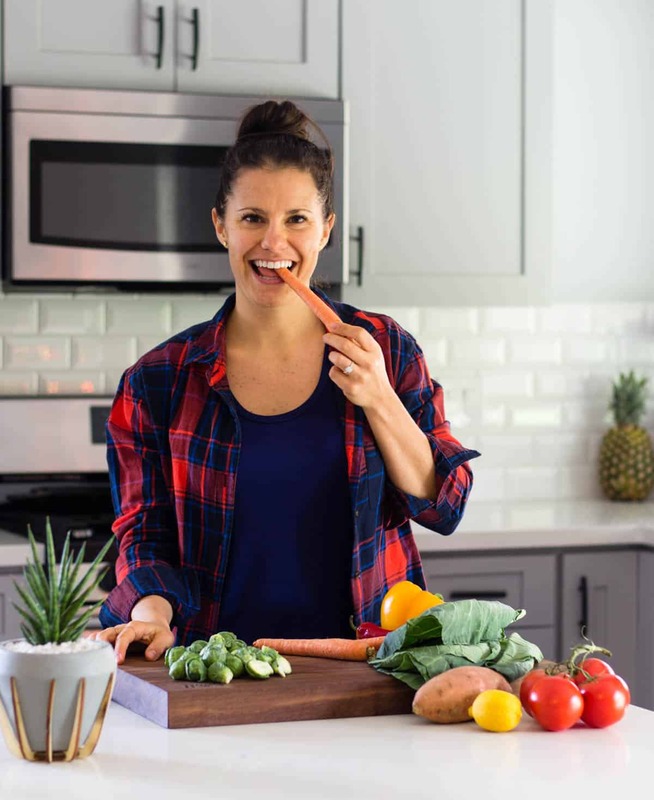 Paleo, vegan, & gluten free. Melt chocolate in a double broiler. In a medium size pot add water and bring a slow boil. Place a glass bowl over top and add chocolate and stir until melted, about 2-3 minutes. 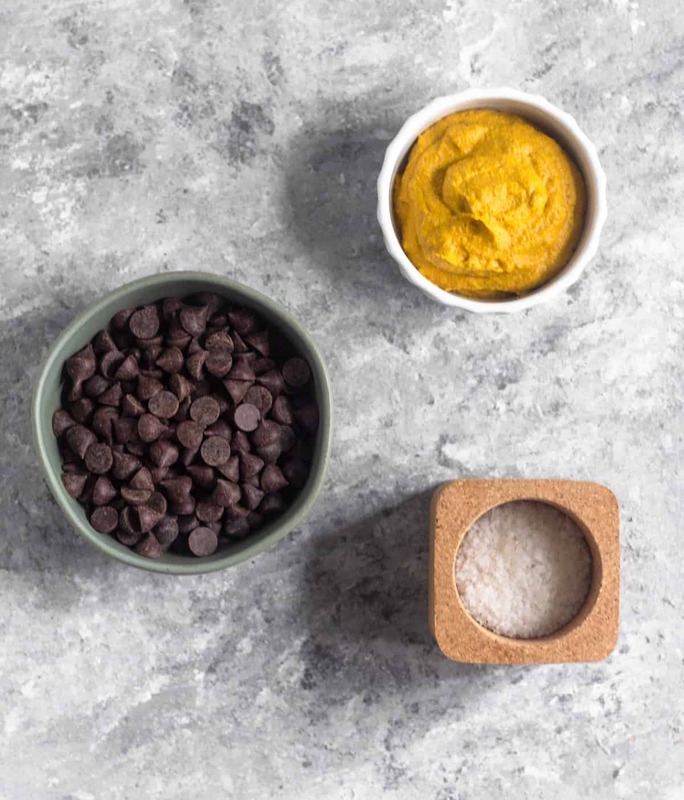 Fill 12 silicon mini muffin cups with 1/2 tablespoon each of melted chocolate, making sure it coats the bottom and pressing it against the sides to form a cup. Place in freezer for 5 minutes until hard. 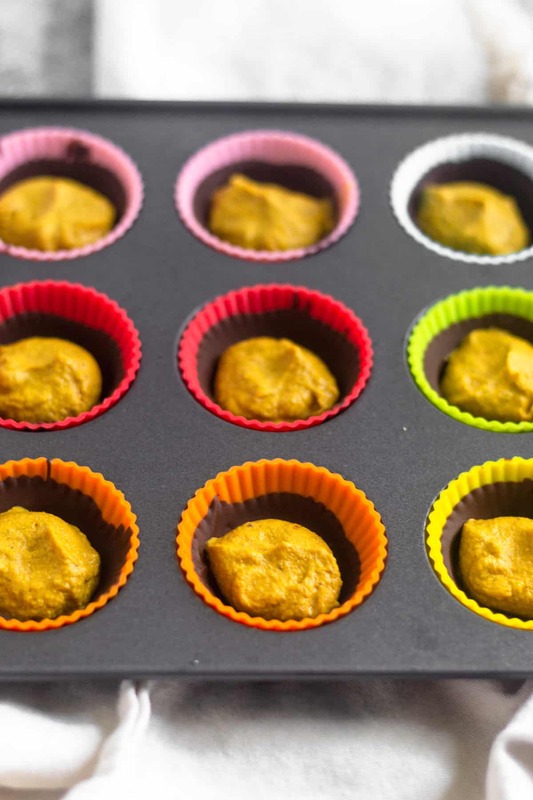 Once chocolate is hard, fill cups with about 1 heaping teaspoon of pumpkin pie butter. Top the cups with the remaining chocolate (about 1/2 tablespoon each). Sprinkle with sea salt and place in freezer until set, about 5 minutes. Store in the freezer until ready to eat! These looks AMAZING. Holy crap. Would never have thought to mix pumpkin and PB but now I’m obsessed with trying it! 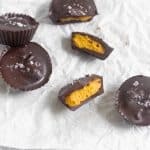 They actually don’t have PB in them, but pumpkin and PB is a great combo! I’ve done it a few time! Hope you enjoy! !